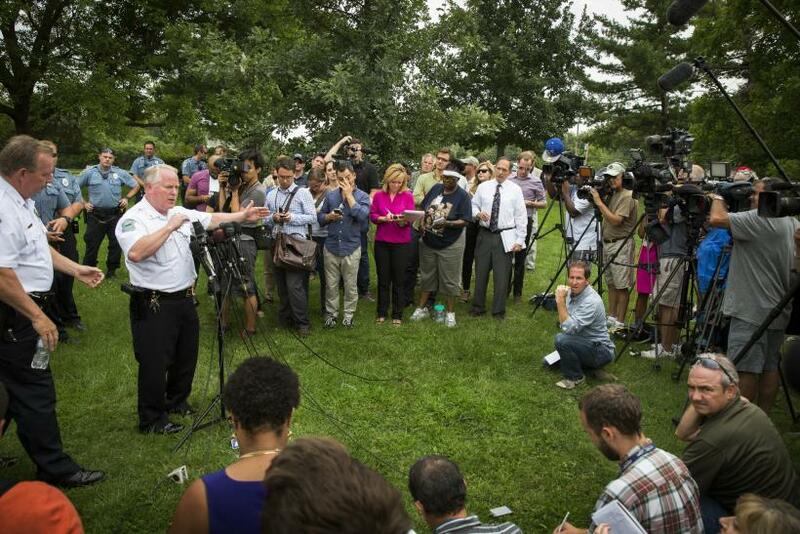 The police officer who stopped and then fatally shot unarmed teenager Mike Brown wasn't aware Brown was a robbery suspect at the time, Ferguson Police Chief Thomas Jackson said during a press conference late Friday, hours after the release of a police report that revealed the 18-year-old had allegedly been involved in a convenience store robbery just minutes before he was killed. Johnson said Officer Darren Wilson stopped Brown and his friend, Dorian Johnson, because the pair “was down the middle of the street blocking traffic.” The alleged robbery took place minutes before they were stopped by Wilson as they walked down the street. Police officials appeared to link the robbery and the shooting together early Friday by revealing Wilson's name and the details of the robbery at the same time during a press conference. Johnson had previously said he was walking alongside Brown when Wilson ordered them to get out of the street. He said Brown never attempted to reach for the officer's gun and was surrendering with his hands in the air when Wilson fired. "[Brown’s] hands immediately went into the air and he turned around to the officer," Johnson said. "My friend started to tell the officer that he was unarmed and that he could stop shooting. Before he could get his second sentence out, the officer fired several more shots into his head and chest area. He fell dramatically into the fatal position. I did not hear once he yell 'freeze,' 'stop' or 'halt.' It was just horrible to watch."